We discuss the implications of our analysis. Persistent regulatory issues continue after the 2008 crash, threaten the stability of financial flows and the world economy, and undermine our democratic societies. The global nature of these issues requires serious efforts to harmonise regulation, create consensus, and promote transparency and enforcement. Our analysis reveals that financial lobbying groups block meaningful reforms through regulatory capture, moral hazard, and unregulated financial flows. 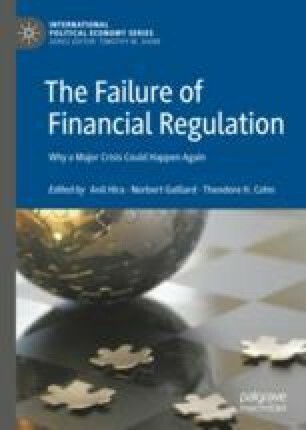 The result is that global financial systems continue to be over-leveraged, suffer from unrealistic risk assessments, and operate in the shadows of domestic regulation, while still relying on domestic regulators to bail them out—thus frustrating taxpayers and spurring populism. In short, there is every reason to believe that a crash might happen again. Werner, Erica and Damian Paletta. 2018. 10 years after financial crisis, Senate prepares to roll back banking rules. Mar. 4. Found at: www.washingtonpost.com [accessed May 10, 2018].